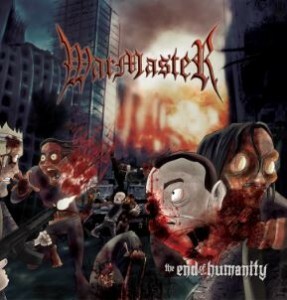 On October 30, Dutch band Warmaster released its second full-length album The End of Humanity. As our earlier review points out, this is an old school death metal release with influences from grindcore. What makes Warmaster worth paying attention to is not style but substance. These songs are made of familiar elements, and don’t push any envelopes, but unlike most “old school” releases these days, they fit together well and sound deliberate. You will not find new revelations here but the music works like an entity of its own, not a grab-bag of parts from 1994. In The End of Humanity, you will find the same power that made death metal a force of musical empire in the 1990s: crushing riffs fit together in tight labyrinths that expand as you traverse them, sonic intensity in distortion and vocals, seemingly unattainable levels of alienation from everyday “be nice to everyone” humanity. You’ll also find a band with its unique voice. Because of this, we’re excited to introduce Warmaster in interview and a live stream of The End of Humanity. Let’s hear what they have to say. You formed as a band in 2004 with the purpose of making old school death metal. What prompted this decision? We all grew up with death metal in the 90s and death metal wasn’t that hot around 2004. We felt the urge and pleasure to revisit Death Metal, the old school way. Inspired by bands such as Bolt Thrower, Obituary, Master and Entombed,we started to write our own songs, blending all the good, which became WARMASTER, straight forward, rude and extremely heavy! What are your own musical influences? Do these match with favorites you listen to on a regular basis? Do you listen to any of the newer-style metal? We all have different influences, The binding influence for us all is 90s death metal. As songwriter bands such as Bolt Thrower, Entombed and Hypocrisy influence me. The newer styles do not influence us much. We respect the wave, but it is not our thing. I had a blast trying to piece together some of the musical allusions you made on this record. So far I’ve identified Blood, Massacre, Terrorizer, Master and perhaps Malevolent Creation. Did I miss any? Thank you, you just compared us with bands we never thought of. Thinking about it, yes you are right on those, but we are also identified us with Six Feet Under, Bolt Thrower, Asphyx, Benediction and many more. Do you feel a need to live up to a “Dutch style” of death metal? Are you fans of the older Dutch bands like Pestilence, Sinister, Ceremony and Asphyx? Not at all! We do it the Warmaster way! The common feel though is same with these bands you mention! Have you talked to the guys from War Master (TX) about having such similar names? Are you worried about causing confusion? Actually there are multiple Masters of War. You also a thrashy Warmaster from Canada and a Portuguese black metal band called War Master, who were the first using this name. I do not think people will mess it us up. We both play old school, but you definitely hear differences in music and sound. War Master is a bit faster, while we mostly keep it midpaced, doomy and groovy! On “Medestrijders Voor Volk en Vaderland” you experiment with some unnerving guitar sounds. Can you tell me how this develops the theme of the song? This is actually one of the fastest songs we wrote. Rik came to rehearsal with the opening riff and without boundaries and jamming, the song wrote itself. Half of the songs on this album have been written this way. “The End of Humanity” begins with an intro that recalls the 1980s style sonic paste-ups that Discharge did. What made you choose this intro? We were playing with song and album title. The original title for the album and the song “Nuclear Warfare” was “Massive Kill Capacity,” which gave Corné, who created the samples for the album, some great ideas. He is very much into bombastic, theatrical themes. He made several samples of which some are used on the album. This is a great opening of the album! It seems to me the album has a theme based on the title. Why did you choose this now, after most people assumed nuclear war and human self-destruction were off the table after the end of the Cold War? Or did the Cold War not end, or are there newer threats? Decimation of humanity the horrific way are good themes to write song lyrics about. They cannot be bound to one war or another. “Death Factory” is WWII, with “Barbarians” we go back to prehistoric warfare. And “Medestrijders voor Volk en Vaderland” is about the 80-year war in the 1600s in Europe. I quote from a punk band of great repute: “World peace can’t be done. It just can’t exist.” Do you think there are solutions to humanity’s problems? Will they be revealed through death metal? The only solution to world peace is going out with a big bang! …Destruction of the planet! As long as there are humans, war will be there as well! Death metal is the solution to write about war in the best way, brutal and aggressive! You have this great guitar sound on the album, that’s fuzzy and warm like a sweater but mean like the metal treads of a tank. How did you record this album? Do you have a “Warmaster method” of recording yourselves? The guitar sounds really fits; we experiment a lot with guitar sounds. We have our own Studio, so it’s easy to realise this. After all those years we receive a lot of experience while recording other and own bands. Also listing to recordings of other bands it give you an idea what you want. Members of Warmaster come from other bands. Can you tell us about those bands, and whether they’re still active, and if not, why they ended and what you hope will be different with Warmaster? We all played in different bands, some still play in other bands. Rik has also played in this band as a bass player. He quit to fully concentrate on Warmaster. Alex replaced his spot in this band. This band is still active and busy with their fourth studio album. Alex also played in a band called Exploded (Thrash Metal) but he stopped with this band this year. It is still active. Marcel plays also in Ceremony of Opposites (Death Metal). Please forgive me for this question. This cover looks a bit… uh… well, maybe people seem to be reacting badly to it. Can you tell us why you chose it, and why it’s important to the album’s theme and vision? Are you planning on having an alternate cover? Hahaha…. I have one short answer for your last question.. No! We don’t have an alternative cover. Because we like this cover! After the first album First War we wanted something different. I think we accomplished that task. It is different, it is rare. When recording the album we asked a friend (Ammar) of ours to draw some of our ideas, it ended like it is right now. We knew what kind of artist he was and what he could do. We wanted to give him a opportunity and he took it. We took the chance what people think about the cover but we don’t care what others think. We like it! Maybe with the third album we do something else, something unexpected. Some people will like it, others will not. But hey, so will our music! You like it or you don’t like it! What’s next for Warmaster? Will you tour, or write more material? Do you have a long-term plan or are you just enjoying the ride? We are very creative lately. So far we have released a split 7” EP with Humiliation from Malaysia and our album The End of Humanity on DeadBeat Media and Slaughterhouse Records. And we already have enough material for a new album ……so new album next year! With the album out we want to play many shows, because playing live is what makes us go on! Maybe tour if the right options are there, but we prefer single shows or weekends instead. Brace yourselves: there are two masters of war. One, War Master (with a space), is from Texas and make old school death metal. The other, Warmaster (no space), are from The Netherlands and make grind-infused old school death metal. The End of Humanity begins with one of the few Discharge-inspired apocalypse intros that are worth hearing and suggests to me a long lineage in grind. What follows is death metal in the American style with influences from Terrorizer and Blood. Since they’re Dutch, and will get compared to Dutch bands anyway, it is worth mentioning that there is a passing similarity to the first album from Sinister, perhaps infused with something that uses a bit more rhythmic fluidity as opposed to internal conflict, more like an American heavy death metal band like Malevolent Creation. Thick luscious vocals growl alongside the beat, injecting something almost like groove except for its offsetting contrast to the mood. Riffs, while bludgeoning streams of power chords, show a high degree of internal tempo change that gives them texture, and occasional melody. This marches forward on functional drumming that knows when to stay out of the limelight and accent guitars to build a greater surge of mood. Allusions to Blood dot the album, from the abrupt tempo changes to the rhythmic position of vocals in respect to the snare. However, there’s a whole host of other allusions too from the classic death metal world, but none are lifts. They are similar ideas, applied in new ways. While The End of Humanity tapers off into songs that are slightly more experimental and more sparse and drawn out, the intense roiling wave of power from the first half carries through and makes the whole an enjoyable experience. Like the bands it honors with its style, Warmaster is going its own way, driven by its own quest, and the result exceeds what any emulation could achieve.